Build it. Share it. Make a difference. Drive fan engagement, awareness and tune-in for Season 2 of A&E’s Born This Way – an inspiring reality TV show about adults with Down syndrome. Inspired by the Born This Way stars’ stories, we created GIFs for Good with A&E. 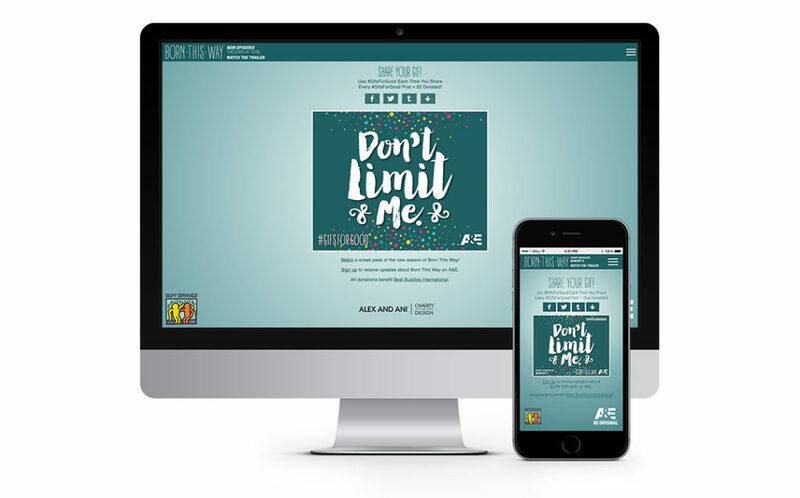 The campaign was also in partnership with the non-profit Best Buddies International and sponsored by eco-conscious jewelry and accessories maker ALEX AND ANI®. GIFs for Good puts a sweet spin on a GIF creator in four simple steps. Users choose an empowering quote from the show. Then, they choose a colorful animated background or upload a personal background image of their own. Finally, the GIF is complete when users pick a unique, stylish font. But it’s step 4 that elevates this classic campaign into an extraordinary enterprise. Step 4: Every GIF shared publicly using #GIFsForGood results in a $1 donation to Best Buddies International. The donations support Best Buddies International’s vital mission – to end the social, physical and economic isolation of the 200 million people with intellectual and developmental disabilities. This mission is intrinsically related and relevant to Born This Way; so ultimately GIFs for Good transformed sharing on social media into sharing for social change. With over 240,000 Facebook Share impressions and 2.2 million Twitter Share impressions, fans loved the heartwarming campaign, commenting that it was “authentic and inspiring!” The GIFs for Good site received tens of thousands of visits in its first few weeks, resulting in almost $10,000 in donations. The campaign continues to go strong raising more and more funds.